For new years, I sported a glittery midnight blue. It was a gift from my aunt. The nail polish is from Ulta. The polish is not as pigmented as I hoped it would be, so I used the NYC in denim blue as a base. It turned out to be a really nice combo. 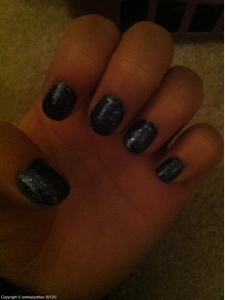 I really wanted to greet the new year with glitter, so I did...with my nails.